March 14, 2017: Caring for the Caregiver. The Victoria Standard interviews CNS's Maggie Roach-Ganaway. December 23, 2016: Thousands of Canadians languish in limbo as they wait for long-term care. CNS Executive Director Angus Campbell, and caregiver Brenda Joudrey, are interviewed. December 2016: A User's Guide for Caregivers. This article, featured in Good Times magazine, highlights the importance of caregiver self-care and getting information about your loved one's condition early on. Angus Campbell is interviewed. November 29, 2016: Dementia in Canada: A National Strategy for Dementia-Friendly Communities. This report, developed by the Senate Committee on Social Affairs, Science, and Technology, examines the actions that should be taken to most effectively and efficiently meet the challenge of dementia and its treatment. A series of meetings was held earlier in 2016 that involved testimonies from a range of experts from healthcare, research, home care, caregiving, and dementia advocacy organizations, which also inform the report. A quote from Angus Campbell's testimony is included on page 19. November 18, 2016: ESDC Minister consulted with stakeholders on maternity, parental, and caregiving benefits. The Minister of Families, Children and Social Development met with various stakeholders to look at expanding Employment Insurance to provide more flexible maternity and parental benefits, and more inclusive caregiving benefits. September 22, 2016: A Commitment to Community Alliances. Great article by 211's Suzy Teubner on the importance of community partnerships and CaregiversNS's successful collaboration with 211 since their launch in 2013. August 9, 2016: FRAUD ALERT FOR NOVA SCOTIA - A scam has been reported to Amherst Police involving a help wanted ad requesting '"an experienced caregiver for mother in law suffering from dementia." More information here. June 22, 2016: Medical Assistance in Dying (MAID) Policy Alert Update. The Update discusses the key highlights of the final version of the legislation and what will happen next now that a MAID law is in place. May 24, 2016: Canadian Employers Can Do More to Help Individuals Affected by Multiple Sclerosis - According to a new report by the Conference Board of Canada's Canadian Alliance for Sustainable Health Care, Canada may not be doing enough to provide workplace accommodations and income supports to people with MS and their caregivers. The Cat Country Morning Show speaks with our own Cindie Smith about Caregivers Nova Scotia, and about our peer support groups in Truro & Stewiacke. You can listen to the interview here. April 20, 2016. 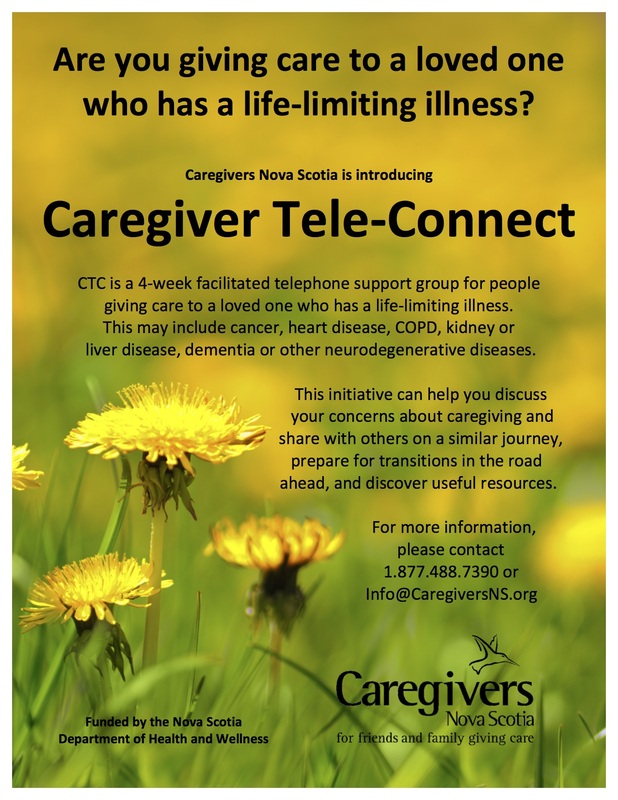 March 2016: We are pleased to announce Caregiver Tele-Connect (CTC), a new initiative supporting caregivers who are caring for a loved one with a life-limiting illness who is likely to pass away within the next year. Please click the poster below to learn more about the program and how to participate. We can no longer afford to treat family care as essentially free labour, undertaken within families as a private matter with no relevance for the rest of society. Cape Breton caregivers suffer social isolation as they are left to care for elderly parents. Family caregivers need help to sustain the health-care burden they carry. Cape Breton's Information Morning speaks with our Maggie Roach-Ganaway about CNS programs and services. You can listen to the interview (8 mins) or read the article. October 23, 2014. Thank you to Brenda Tomie for her contribution to the interview. Stats Canada Report Reinforces Urgent Need for Home Care in Canada - Unpaid caregivers are increasingly relied upon to fill in the gaps in service, and are at higher risk of having unmet needs for help or care themselves. Rising to the Challenge: Responding to the Increasing Demands for Home Care - This report looks at the current state of home care, demand for services now and in future, and the capacity of the sector and its partners, such as family/friend caregivers, to provide care. In consultation with employers, a government panel will identify strategies to help workers balance job responsibilities with caring for a loved one. My Sick Husband is Living His Story. Do I Have the Right to Tell Mine? The Caregiver's Burden: What Is the Real Cost?